Jean was Valedictorian of her high school graduating class, the Geneseo High School Dragons, and then went on to earn her teaching certificate from Kansas State Teachers College. Soon after that Jean moved to Solomon and was employed by the DS&O Electric Company until starting her family. She later worked as the Solomon City Clerk and then returned to the DS&O when her children were older and remainder there until she retired. 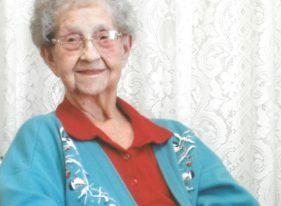 She was an active member of the Solomon United Methodist Church, serving on the church council, teaching Sunday school, and acting as treasurer. Jean was also dedicated to her community. As a member of Jolly Jill’s EHU she played a significant role in bringing a pool to Solomon. One of Jean’s greatest accomplishments was being elected as the first female City councilmember in Solomon and serving two terms. Jean’s final resting place will be in the Prairie Mound Cemetery near Solomon. Visitation will be from 7:00 p.m. – 8:00 p.m. Friday evening, April 19th, at the Carlson-Becker Funeral Home. Memorial contributions may be made to the Abilene Chapter of DAR (Daughters of the American Revolution) or to the Shriner Family Scholarship Fund and may be sent in care of the Carlson-Becker Funeral Home, P.O. Box 308, Solomon, Kansas 67480. Condolences may be sent to the family at www.martinbeckercarlson.com.